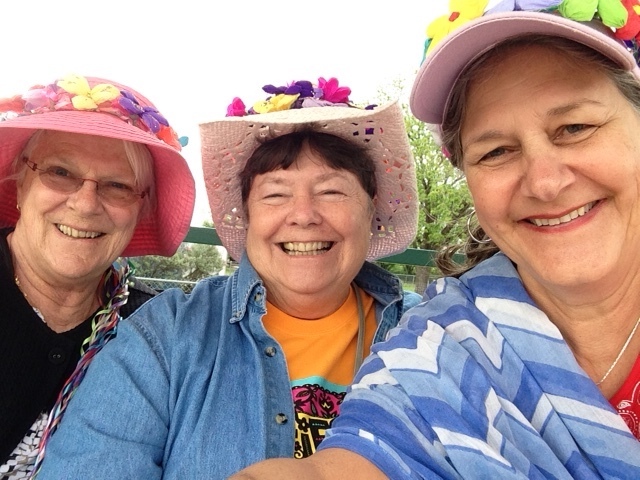 I just returned from an RV road trip to San Antonio, Texas with two friends, Suki and Lee, where we experienced “Fiesta!” first hand. And I must say, San Antonio knows how to throw a party. True to their word, “Fiesta!” is a city-wide celebration — parades, music, food, marching bands, bright costumes, colorful hats, prancing horses and lots of smiles for ten days. 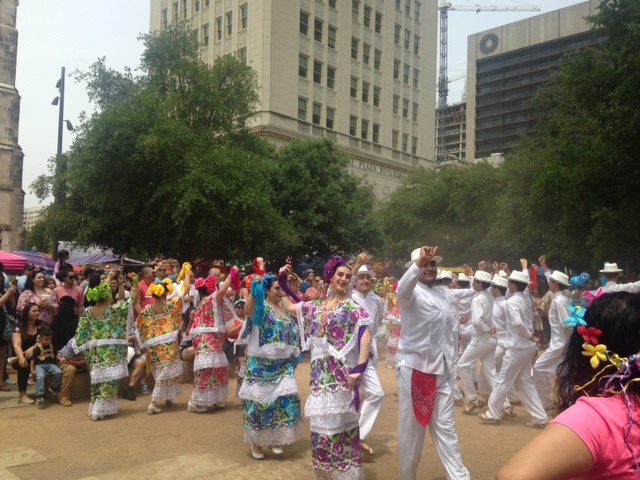 “Fiesta!” had an unassuming beginning in 1891 with a flower parade to honor heroes of the Battles of the Alamo and San Jacinto. 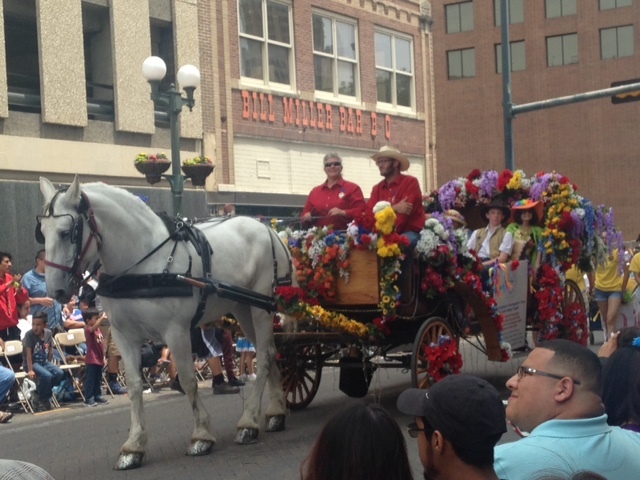 Over time the Battle of the Flowers has grown to the second largest parade in the nation behind the Tournament of Roses. 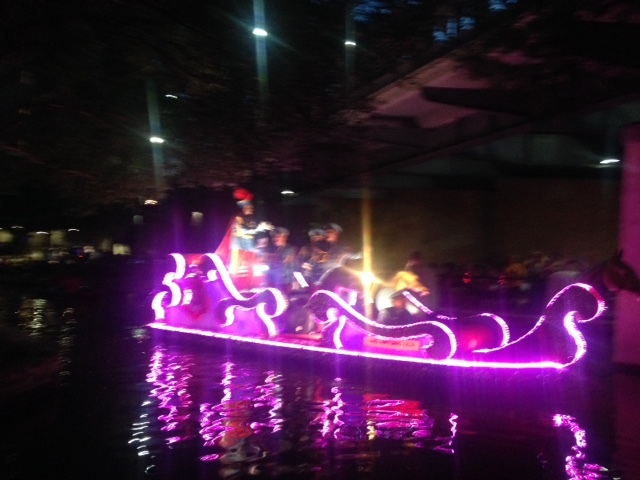 In 1941 the Texas Cavalier’s River Parade was added as an evening attraction on the river. Each brightly lit themed barge floats down the river with its own live music. After ten days of balls, carnivals, neighborhood parades, street dancing, cultural events, military presentations, children’s activities and coronations of “royalty,” (Whew!) 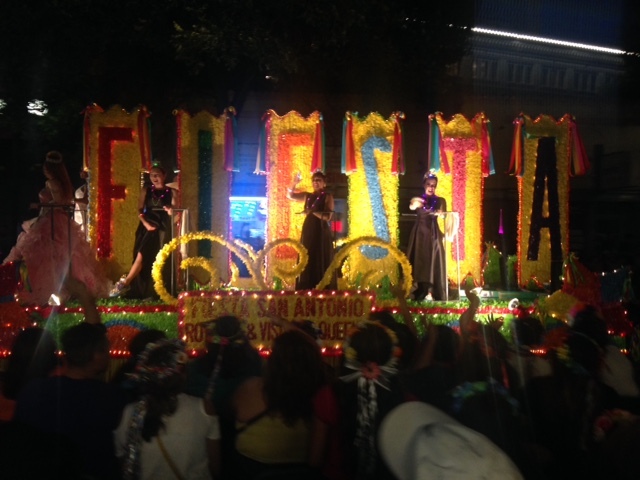 the party comes to an end with a grand finale — the Fiesta Flambeau Parade. Added to the festivities in 1948, the Flambeau Parade is the largest nighttime parade in the U.S.
For over three hours we watched floats glide down the streets like mobile Christmas displays. Horses wearing lights on their harnesses pulled illuminated carriages, followed by illuminated cars, floats, bands, musical instruments and dancers. The city must purchase every battery-powered sting of lights in the U.S! In addition to the fun, this annual event raises millions of dollars for nonprofit groups, local charities, senior volunteer programs, libraries, children’s programs, cultural centers, conservation societies, scout groups, church groups, civic clubs, and scholarships for local students — to name a few. 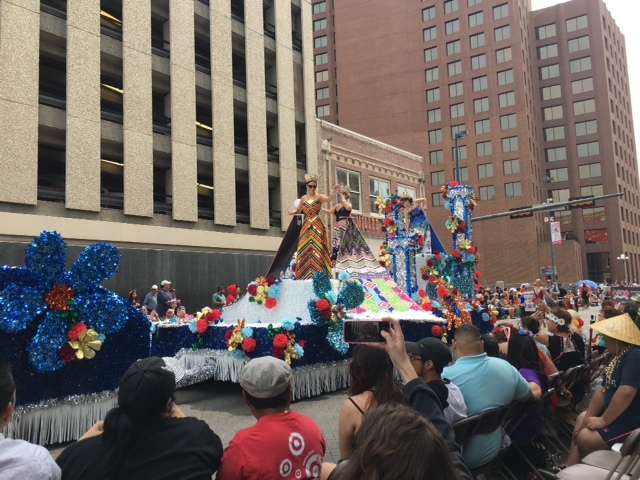 Last year Fiesta generated $340 million for the local economy, supported over 3000 full-time jobs, attracted 2.5 million event attendees and mobilized 75,000 volunteers. I’d say that’s DEFINITELY a Party with a Purpose! But that brings a thought to mind — Purpose. And a question — Do I party with a purpose? Partying and purpose are not necessarily exclusive. After all, Jesus Himself was a “Party with a Purpose.” People loved being around Him. They laughed and learned, got healed and celebrated. His first miracle was turning water into wine at a party — the wedding at Cana. Jesus took the party with Him wherever He went and looked for the God opportunities along the way. He said, “I tell you, the Son can do nothing by himself; he can do only what he sees his Father doing, because whatever the Father does the Son also does.” (John 5:19) Crowds followed because He reminded them that they had value — and purpose. We attended “Fiesta!” but also brought the party with us: praying for a man with back pain, praying with a woman who needed encouragement, helping a man heal from old wounds, praying for a man’s voice to return and praying for people in the crowd without even telling them. We had a wonderful time watching the parades, listening to the music, eating great food, walking miles through the city, shopping a little and laughing a lot. We met so many wonderful people, listened to their stories and, most importantly, made lots of new friends. We got to participate in of one of the biggest parties I’ve ever seen, but we kept our eyes open for the God opportunities around us. Those opportunities are everywhere — even in the middle of a party. I think Jesus modeled this. Life is a gift with a purpose and it’s meant to be enjoyed. Jesus brought the party with Him, but never lost His purpose. Christ followers who are always somber aren’t much fun. No wonder the world isn’t interested in what we have to offer. I’m learning I can be light-hearted and still have purpose. After all, Jesus really is the most fun you can have. And that’s a party. I want people to look at my life and say “She was a Party with a Purpose!” How about you?